Does your iPhone 5 have a cracked screen? Do you need an iPhone replacement screen repair? You can send us your iPhone and one of our experienced technicians will repair it for you! We have the parts in stock and our turn around for repairs on this model is 1-2 business days as we have anything necessary to complete a prompt and efficient repair. 365 Laptop Repair, based in Los Angeles, California specializes in screen replacements and has competed thousands of repairs! 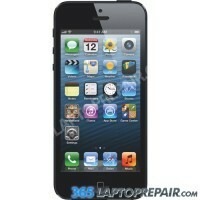 Come to 365 for iPhone screen repair Los Angeles! We are so confident in our work that we offer a whole 3 month warranty for this repair! We can also repair issues with the power button, home button, headphone, battery, and other problems. The front touch screen of the iPhone 5 (called the digitizer) can be replaced to return full touch functionality and cosmetic appearance to your device. The LCD screen comes pre-attached to the digitizer and cannot be replaced separately, so both are replaced in this repair. The screen replacement service we provide includes the cost of a brand new touch screen digitizer for the iPhone 5 and the labor to install it. We use genuine new digitizers, not aftermarket or cloned products. 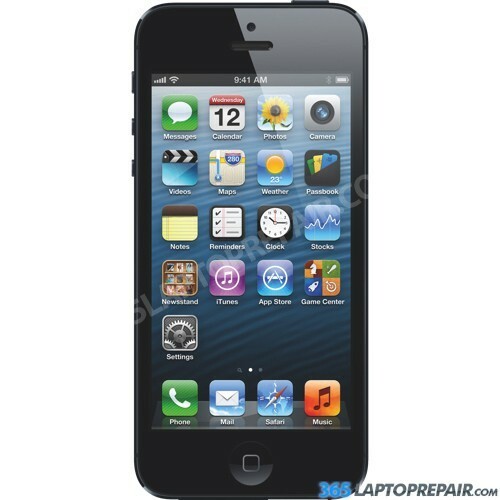 Are you ready to start you repair and get your iPhone fixed fast? Click the add to cart button for your appropriate repair below to begin the checkout process. If you are unsure if you need select free diagnostic and we will fully test it to determine the problem once we receive it from you. We accept credit cards and PayPal. We offer many shipping options to and from our repair shop. You can pack your iPhone and ship it to us yourself, or we can send you a pre-paid shipping label and a safe ship box to ship your iPhone quickly, easily and safely! If you have any questions about our repair service please Contact Us. Next day shipping available from $39. Are you not sure what's wrong with your iPhone? You can send it in to us and we will run a full diagnostic. We will then send you a repair quote for approval. This service is free if you decide to have the repair performed. Broken screen breaking your heart? The front glass touch screen (called a digitizer) and the LCD screen for the iPhone 5 come pre-assembled and cannot be replaced individually. In order to repair the screen, it is necessary to replace the entire LCD screen Assembly. All repairs done with new OEM parts. 6 month warranty on parts and labor included with all repairs. If you do not see the repair you require or you are unsure which repair you need then please use the Free Diagnostics option above.